First let me address our weather, Sandy has been a nasty visitor. Prayers and thoughts go out to all affected in our great nation. I know many of my wonderful blog buddies are in the Northeast and are still without electricity. Thank you to all those who are helping and working around the clock to save those stranded and restore power to thousands. 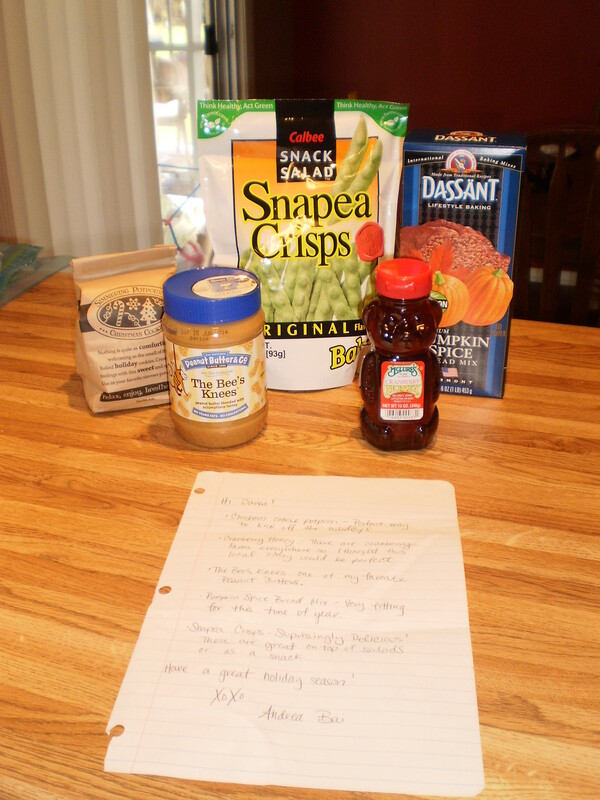 Now on to the FPP>Last month was the first time I participated in the Foodie Pen Pals program. It was such a blessing! So of course I signed up again. If you are not familiar with the program, you can check it out over at: The Lean Green Bean . You sign up after the 15th and before the 5th, you will be paired up with two others. One you will send a box of food items to and the other you will receive a box from. You will receive an email on the 5th telling you who your matches are. Then you contact them to exchange addresses, ask preferences and find out if there are any allergies. You have until the 15th to send your box out, then on the 31st you will blog about your experience. This month I sent a box to Sydney over at Exploring Vegan Life. Go see what I sent her and read about how she used the items. I am excited to read her blog! She is a real sweetheart. 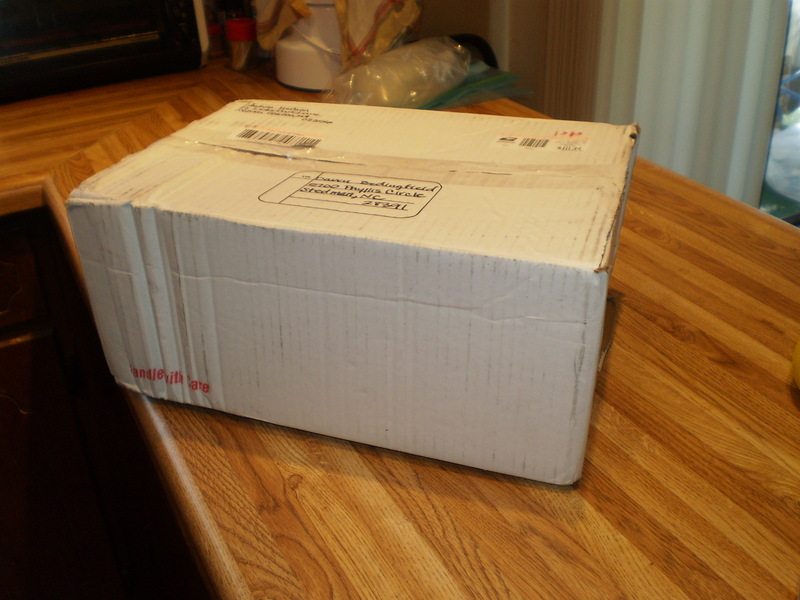 My box came from Andrea over at Glam Hungry Mom. She sent me a box of treats! I was so excited to find this sitting beside my mail box! WOO HOO it's like Christmas each month! A great little bag of potpourri to help my house smell like cookies 24/7 which is difficult. It has made me bake more! A jar of HONEY peanut butter which my husband claimed and took to work for his lunches. He says THANKS, I did get to taste it and if you have Bees Knees peanut butter in your area, get yourself a jar! A delightful jar of cranberry honey, which I used in my Honey Bars. Oh wow, a light cranberry extract added to a smooth honey. I have made two batches using this honey and enjoyed a cup of tea today using the honey. A bag of snacks...Snapea Crisps. I do have to say I was very skeptical about these, but have really enjoyed them. It says to use them on a salad but I ate them straight out of the bag and enjoyed everyone. Last a box of pumpkin spice bread mix that I have yet to make. I've been saving it for next weekend when we are having a big family dinner. Yesterday I really did not want anything on my menu. As the day went on I got to feeling rather ill. So to make myself feel better I made a pot of potato soup. It was an interesting pot, not like normal, because I threw in a few leftover items. It turned out delicious! Cook the potatoes in the broth with the butter and seasonings. When the potatoes are done, mash leaving some chunks, add the leftover squash, potatoes and bacon. The soup was nice and thick. I added the milk toward the end. A hardy meal, filling and right tasty if I do say so myself. 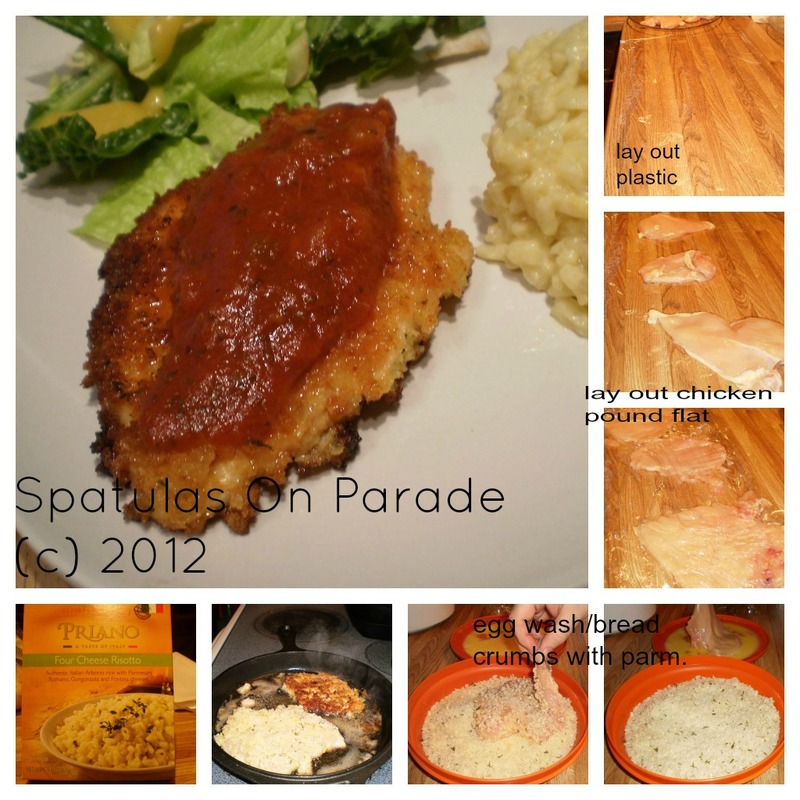 How do you feel about Parmesan chicken? I love it and have cooked it about four or five different ways over the years. 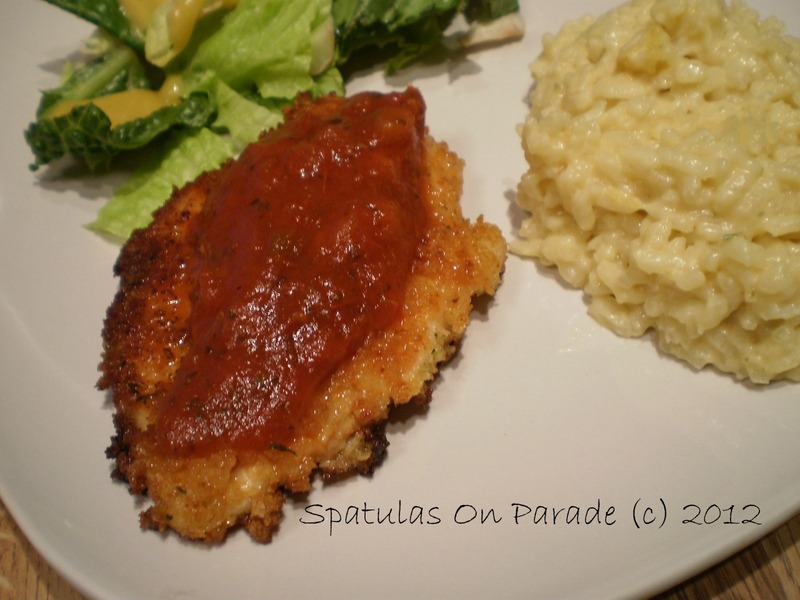 Last night I used panko crumbs instead of regular bread crumbs, fried the chicken in my cast iron pan and served it with a four cheese risotto. It was great. 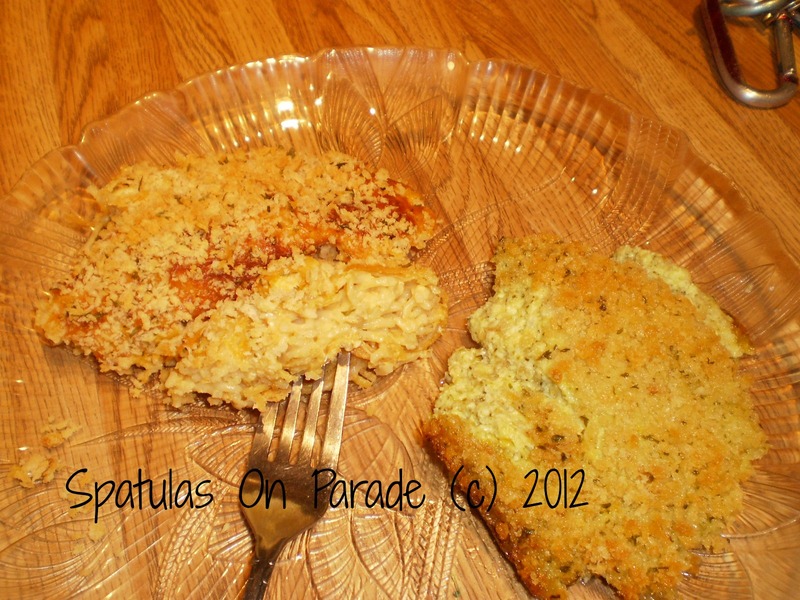 I used 3/4 cup of panko and 1/3 cup Parmesan cheese mixed well and rolled/dipped the chicken in. Acorn squash, a funny thing, it is not an acorn and looks like a sweet potato inside when cooked. It has a interesting flavor, a cross between a squash and a sweet potato. At least to me anyway. I bought one last week and decided to introduce my husband to something new. Actually we had a few new things. Pomegranate, which he had never eaten, acorn squash and quinoa. Two of the three were a hit, the last one he did NOT like at all. He will eat couscous if I fix it but he does like the Israeli style, it is larger and taste more like pasta. The squash was easy, well after I cut it open. It is a tough little bugger to cut open, then the inside is sort of like a pumpkin with the stringy seeds. 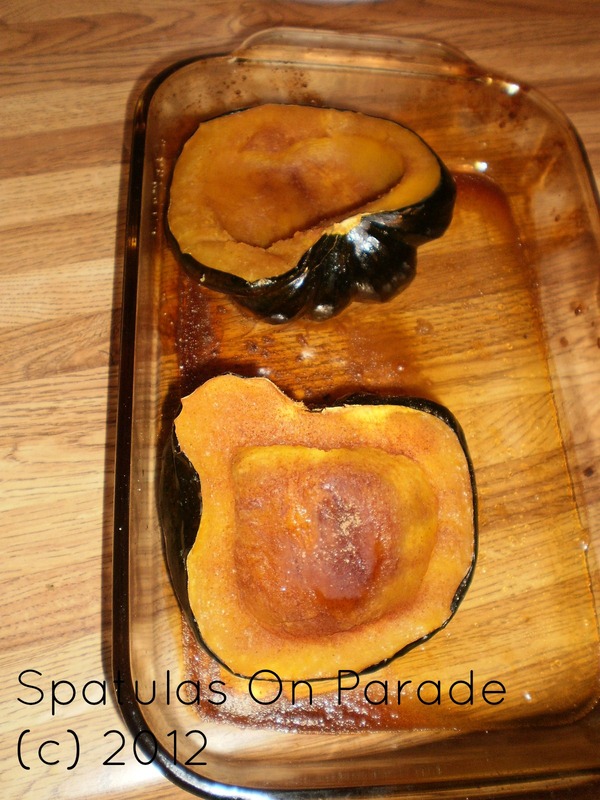 Just scrape those out and place the squash up side down in a baking pan. I added a little water in case. Placed in a 350 degree oven for 20 minutes. Then I flipped them over and sprinkled cinnamon sugar on top and finished the baking process with another 15 minutes. 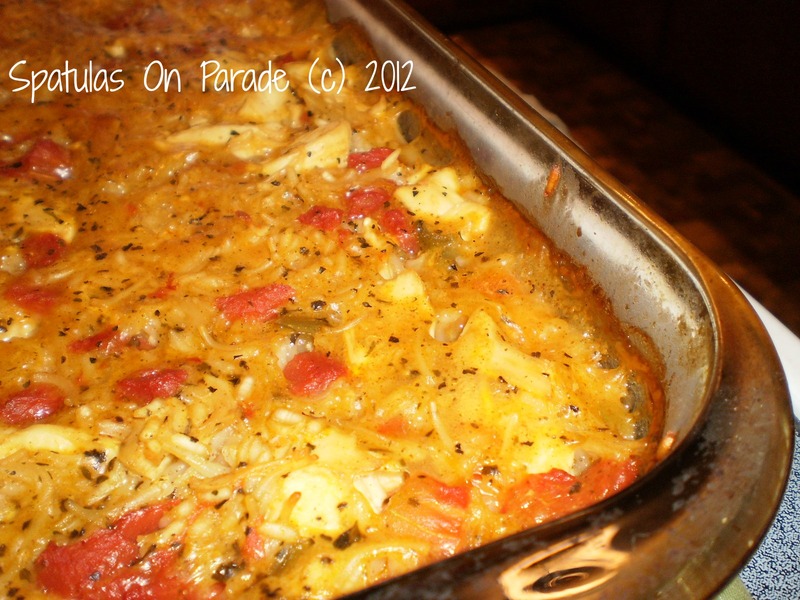 Have you ever made cabbage rolls? Are they a pain to eat? You can't pick it up and to eat it you have to cut it up. So why not do that to begin with? Cut it up I mean. I got to thinking about that last week. WHY have I not thought of that before? Light bulb moment! It was a success and delicious meal, my husband said, You're a genius! haha gotta love that, right? Cook meat, seasonings and onion in a large pan with a lid. 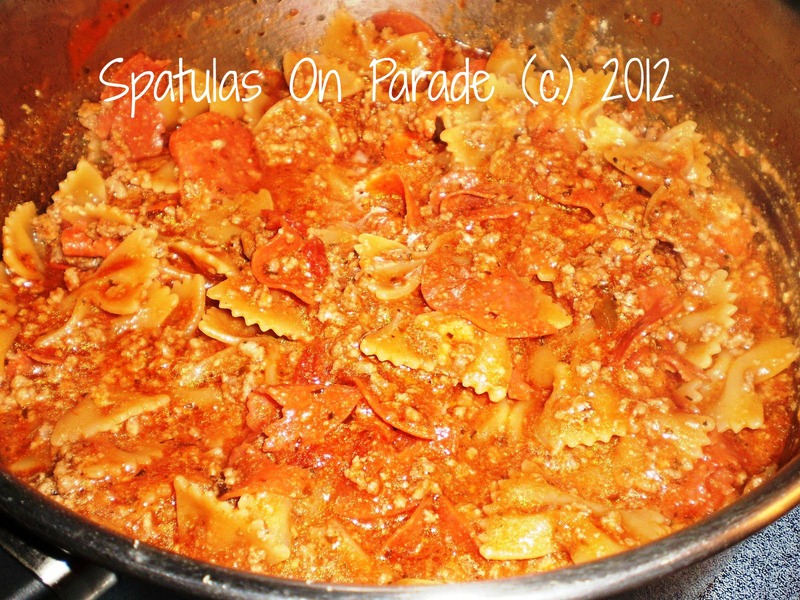 When this mixture is done, add the tomato paste and diced tomatoes. Stir well. Next add the water and diced cabbage, stir and cover. Cook on medium heat until cabbage is tender, about 20 minutes. While this is cooking, it is the perfect time to cook the rice. 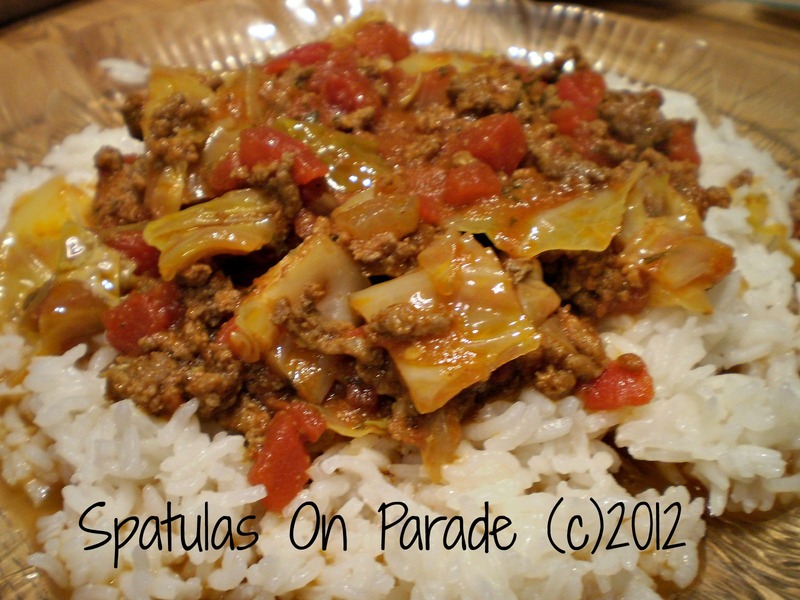 Serve the cabbage/meat over the rice. I'm behind on posting folks, I have several recipes I need to get up here, I apologize. I got a little side tracked with life, health and the magazine...Let's see if I can catch you all up. This will be one of several today. Bear with me please. Saturday I went to the bridal expo with my youngest son and his bride to be. It all became very real very fast! He will be 19 in a few weeks and will also be leaving for basic training with the Air Force. We love her, we truly do and I am blessed to see that they love one another, have a solid relationship with each other and are grounded in their faith. They got engaged back in April, I think...I know I should know when but my fibro is causing brain fog this morning so forgive me. They have known each other about 7 years, dating 2 and will have been engaged for over a year when the wedding date gets here. So this is no rush of foolish young love. ANYway, I said all that to explain that the bridal expo was my idea and that it was not a shock sort of thing. I was honored to go and everyone there of course thought I was the mother of the bride. We got tired of explaining and just started saying yes. I will be her mother-in-law. Which by the way I don't like, the name that is. How about second mother or just mom. Mother-in-law brings with it such a negative note. I don't want to be a MIL. I want to be the other mom. MamaDawn like I am to dozens of young people. We tasted so delicious cakes and some not so delicious foods! I kept walking around tasting this and that, thinking, wow if these people can sell this food, I should go in business! OK, got off track. Sorry. So, I love Taco Bell. I know I should not. It is about the only fast food I eat, when I eat it. However, after hearing on the radio that they use Grade F meat...uh hello, I will not be returning. My favorite is the crunch wrap and I thought,; dang, how hard can it be? So I made my own. It was not hard and they were WAY better, trust me! I should have taken step by step photos to show you how to do this but I think you can figure it out. It is really easy. Cook the meat, onions and taco seasoning together. Take one large tortilla and smear refried beans in the center, place the tostada on top. Now add the meat mix, cheese, sour cream ,salsa and lettuce. Wrap the tortilla and fold it around the stack in the center. Now place this face down in a pan or on a griddle. Once it has sealed and is brown, carefully flip it over. Last week while surfing through the many food pages on Facebook, I ran across a recipe that looked so good, I went to the kitchen and made, right then! I was not disappointed! It was so good in fact, that two days later, I made it again but this time with a few modifications. The original was from Hey, What's For Supper? She calls these Miz EmmaLou's Honey Bars. I just call them addictive! 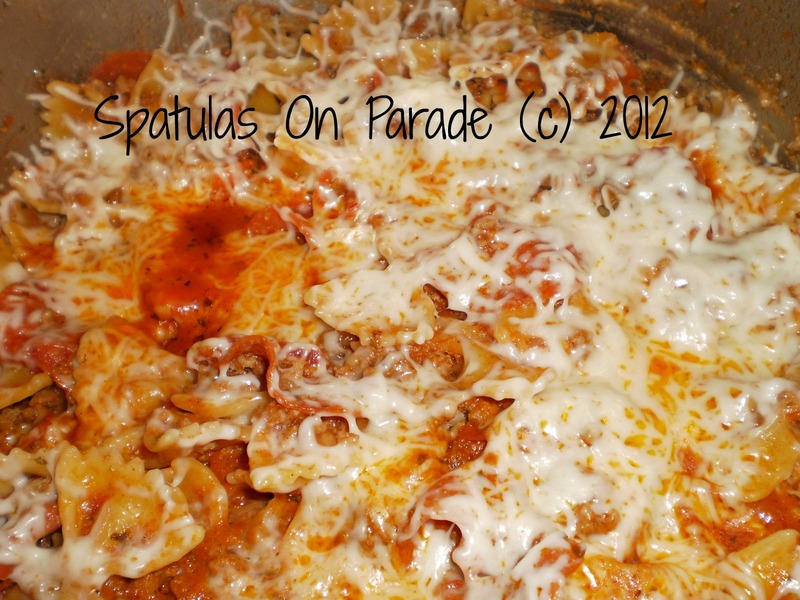 It is a super simple recipe and one that can easily be added to. I did. 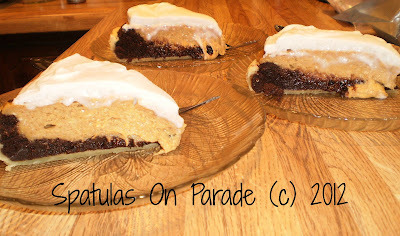 Follow the link above for her recipe. Now the first time I made them, I used cranberry honey and almonds. The second time I used a handful of salted mixed nuts, a handful of spicy granola and a handful of white chocolate chips. This version my son and husband preferred. I liked the almond and cranberry honey the best. I thought I'd do something different and drop a few helpful hints, tip of the day, my favorite type of a post. Was that clear as mud? How about we start with some favorites. Do you have a favorite kitchen item? I do, several in fact. My Vita Mix is a key ingredient in my kitchen, so are my spatulas :) and my Pampered Chef tools. I have them all. Well, almost all. Here are a few of my favorites! My Pampered Chef mix n'chop, love love love this tool. It works great on ground beef even when frozen! 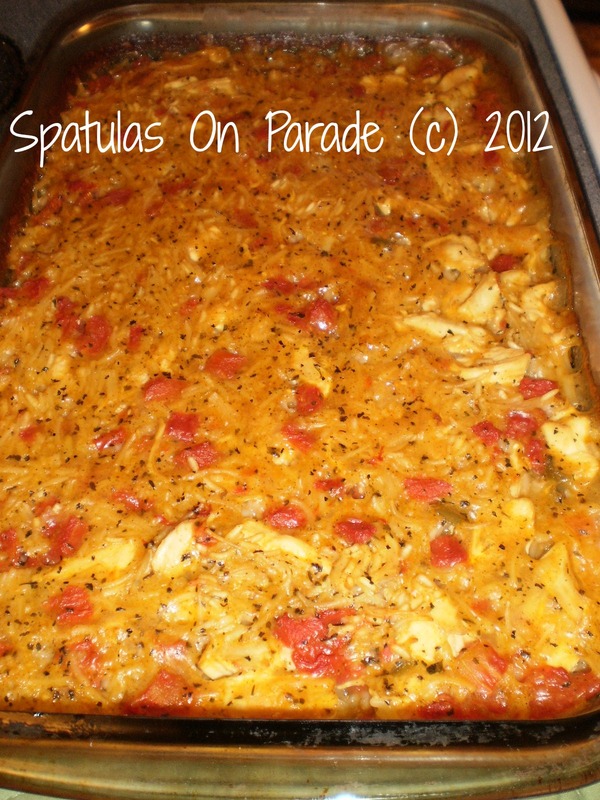 You can even chop cooked boneless chicken with it, mash potatoes, rutabagas or any number foods. Pampered Chef mix n' mash. This whips, stirs, mashes and is a great too and strong! Easy clean up. No I don't sell PC. I just love their products. Now I mentioned my Vita Mix, if you are not familiar it is a SUPER strong blender. It will turn ice into powdered snow, turn vegetables into juice and frozen fruits into delicious smoothies. A powerhouse is what it is. Now how about a money saving tip or two? How many times have you bought a half gallon of buttermilk only to use 1/2 cup? Did you know you can freeze it to use later? It’s true. 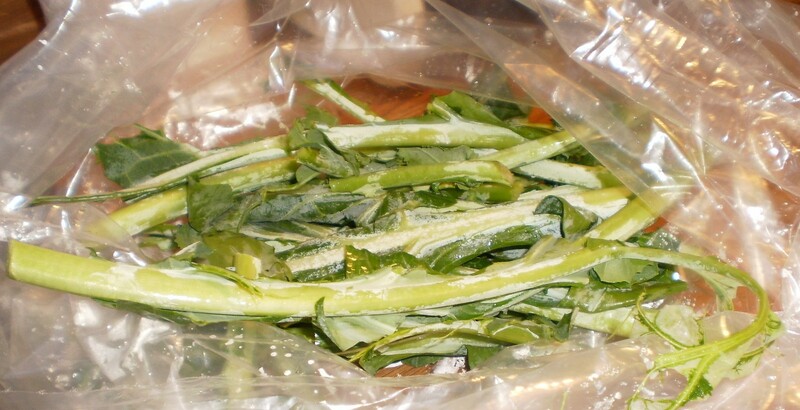 Measure it out into ice cube trays and freeze, then place in a freezer bag with the date on it. When you are ready just pop a few out to use. You can do this with broth, tomato paste, eggs or gravy. Another great thing to freeze is fresh herbs in olive oil. I have saved a lot of money by freezing these items and not buying them every time I need just a dab. For the eggs, crack them and whisk, place one egg in each ice cube section of the tray. You can defrost these in the fridge and they work perfectly in baking or scrambling. How about tomato paste? You buy the smallest can and still only need a tablespoon. Freeze it for about 20 minutes, then take it out and slice it into tsp size servings and freeze. No waste! When those expensive bell peppers you bought start to look sad and you haven't used them yet, don't throw them out. Dice them up and toss them into a freezer bag. Next time you fix an omelet, toss in a few, or you chili and even spaghetti Toss in a few. No muss no fuss AND you saved money by not throwing out more food. Hope this helps you save on waste of food and money. A helpful hint or tip if you have a garbage disposal...oh yes, you can save money here as well. Ladies do you know the proper way to use your disposal, clean it, repair it, and keep it in top-notch condition? You may not need to, you either don’t have one or you have a handyman for a husband, but let’s say he’s out-of-town with work, maybe he’s military and protecting our country. If so, THANK YOU. Been there. What do you do if it breaks, gets jammed or stuck? Do you call a plumber, at $65 an hour for something you could fix yourself? I say NO. WAIT for just a few minutes and maybe no money at all, you can trouble shoot your disposal and possibly fix it. Would your husband be proud of you to see you saved him money AND did it yourself! Here are a few tips, first, once a month, clean it really well. You can buy a cleaner but you have all you need right there in your kitchen cabinet. Yes, trust me, you do. Pull out the box of baking soda and pour a cup full down the drain, now flush it with hot water for about a minute while the disposal is running. Also you can add DAWN dish detergent, this is the best one for the job. Gotta love the name too, right? It is the grease fighting agent that makes it work so well. Now, to sharpen those blades, drop in a cup full of ice cubes , turn on the disposal and let’er rip. It will sound horrid, but will sharpen the blades. Now to keep it smelling fresh-cut a few lemons into quarters, shove them in the disposal, turn on the hot water and let those puppies become lemonade in the drain. This is especially nice after a few heavy days of use. These simple things once a month will keep your disposal clean and in better working order. They will save you money and keep your kitchen smelling nicer. The plumber may not be happy because he will have fewer jobs but maybe you will only need him for the ‘big’ jobs. Also, I am sure you know, don't put banana peels, bones or grease down the disposal. If your disposal becomes jammed, turn it off! Do NOT stick your hand inside, use a pair of long tongs to remove what debris you can. Once the item has been removed if the disposal still does not work, you may need to hit the reset button. Open your cabinet and see the disposal, on the bottom is a tiny red button. That is the reset. Push it. This should get you up and running again. No need for the plumber to come out when you can do it. Also, in older models a broom handle is a great tool. Seriously, stick the broom handle into the disposal, with it turned OFF of course, now rotate around. Sometimes in older models the gears will get jammed up, moving them gently with the handle will dislodge them and it will go again. IF none of these things work, hopefully your husband can fix it and if all else fails, call the plumber. If you enjoyed this post, then you will love our magazine! www.foodiefriendsfridaydailydish.com has great tips , recipes, crafts and other articles are posted each day at 3,6 and 9 a.m. , noon, 3, 6 and 9 p.m. Check it out! Love to see you there! It also made a nice large pot so there were plenty of leftovers. In a large pot cook the meat and seasonings. Add the water and pasta. Cook for 10 minutes. Add the sauce, pepperoni and Parmesan cheese. Mix well. Cover and cook for 10 minutes. Sprinkle the mozzarella on top and replace the lid. Turn the heat off and allow the cheese to melt. Last night we had 2 casseroles. yep, not one but two. It took all of about 15 minutes to throw together and both were put into the oven. 35 minutes later supper was done. How easy is that? My broccoli casserole is a recipe from my friend Mary. She brought it to our house one night for a potluck. I had never eaten a broccoli casserole that I liked before and I loved Mary's. So I asked her for the recipe and it is the one I use. I have eaten several over the years, or tried, and they were ok but this one I really loved from the first bite. My chicken tetrazzini casserole is an adaptation from a turkey version that a friend brought me after I had surgery many years ago. I left out a few things that she added and my family enjoys it better. 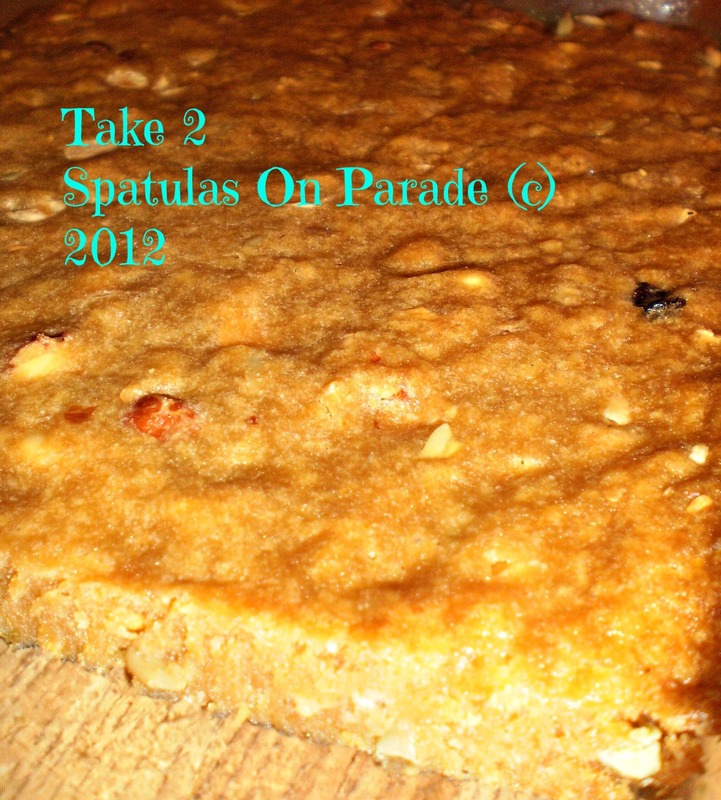 So let me share with you, these two great and easy recipes. Cook the chicken and reserve 1/2 broth/water to add to the casserole. You can cook the chicken in broth, remove and cook the noodles in the broth. 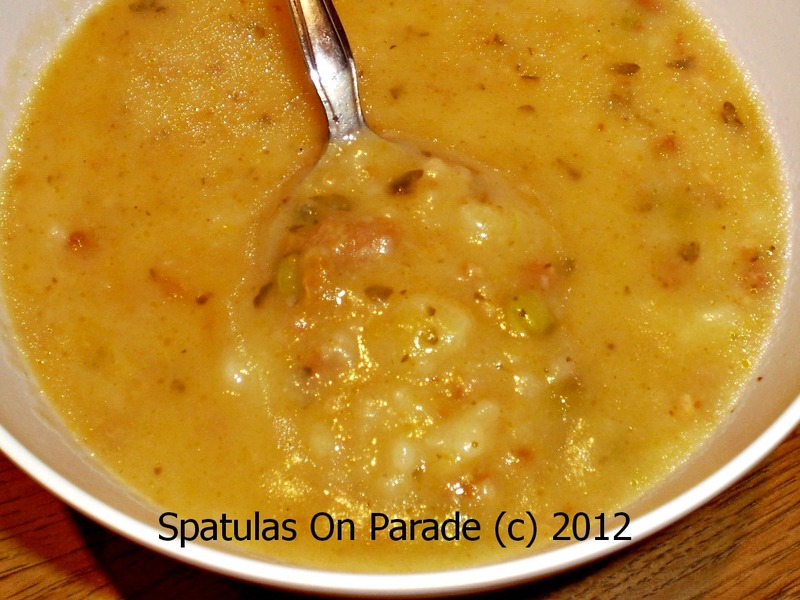 Save 1/2 cup to add to the cream of chicken soup along with the spices and grated Parmesan cheese. 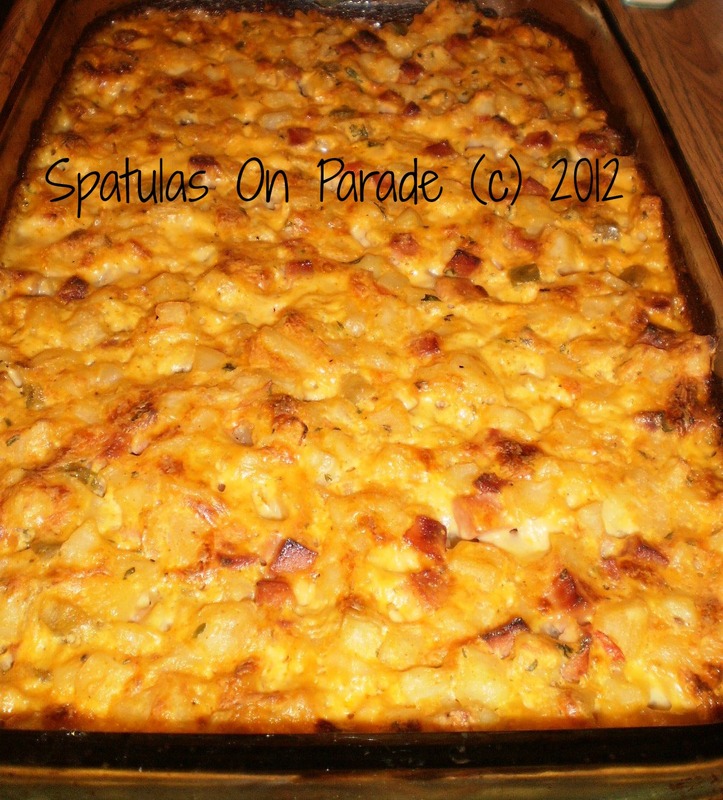 Pour into a 13 x 9 casserole dish and top with bread crumbs, butter and cheddar cheese. Bake for 35 minutes at 350 degrees. In a food processor, blitz the broccoli and onion into a fine mixture. In a large bowl stir together the eggs, mayo, soup and cheese. Now mix the broccoli in with the soup mixture. Pour into a greased 9 x 9 square pan. 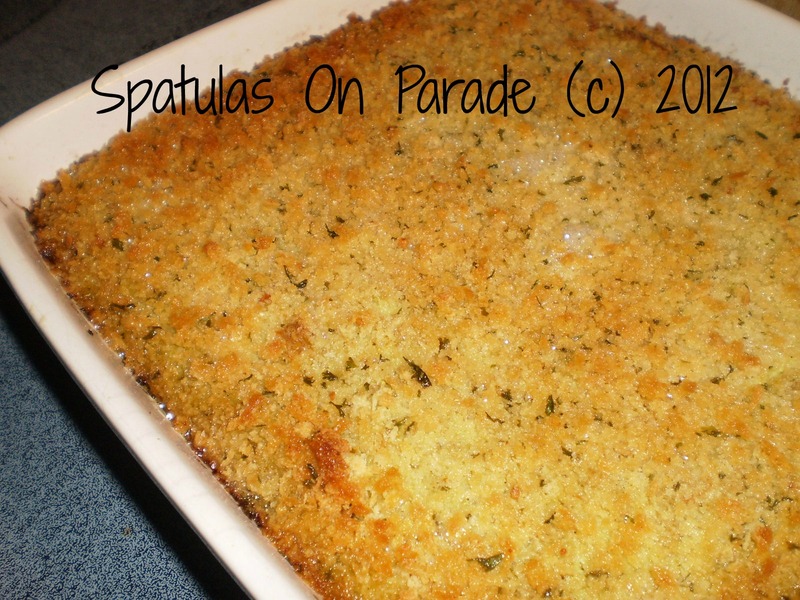 top with bread crumbs and pour melted butter on top. Bake for 35 minutes at 350 degrees. Mary uses Ritz crackers for her topping, which I do love but this time I tried the panko and really enjoyed that as well. Also, she uses 4 cups of frozen broccoli.You decide. Last night I was off. My husband wanted Chinese, so we placed an order and ate in. He had worked hard all day putting in a new heat pump system to our house. WOO HOO we'll have heat, when it gets cold enough for it. For now I'm enjoying having my doors and windows open. Love the fresh breeze, so do my kitties. Friday night was a bountiful feast! 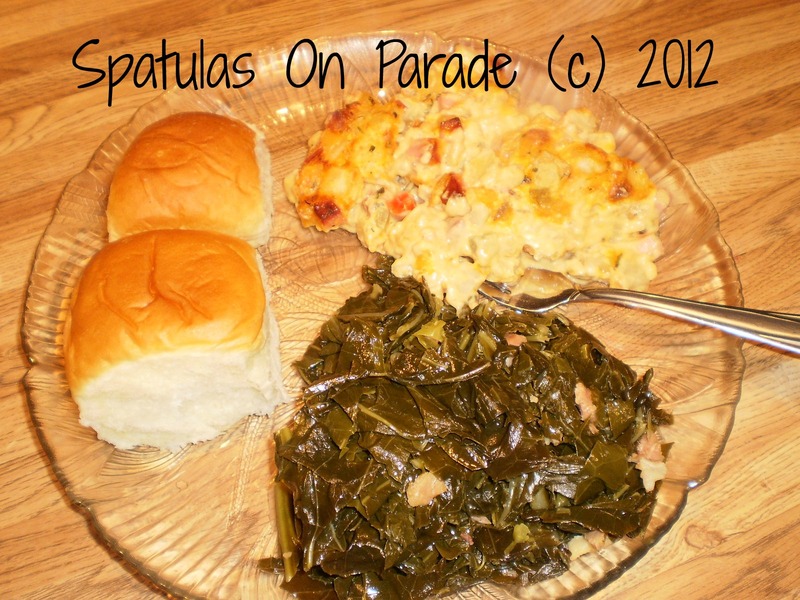 Ham and Hash-brown Casserole, collard greens and our favorite Hawaiian sweet rolls. Oh yeah! Good eatin' there! Here is the recipe for you to try yourself. Tasty!! Mix the soup, milk, sour cream and spices in a large bowl. Add the ham and stir well. Next add the cheese. Now add your hash browns. Pour all of this into a 13 x 9 greased casserole dish. Bake at 350 degrees COVERED with foil for 45 minutes. Take the foil off and bake on 450 degrees for 30 minutes. Remove from the oven and allow to cool for 5 - 10 minutes and serve. 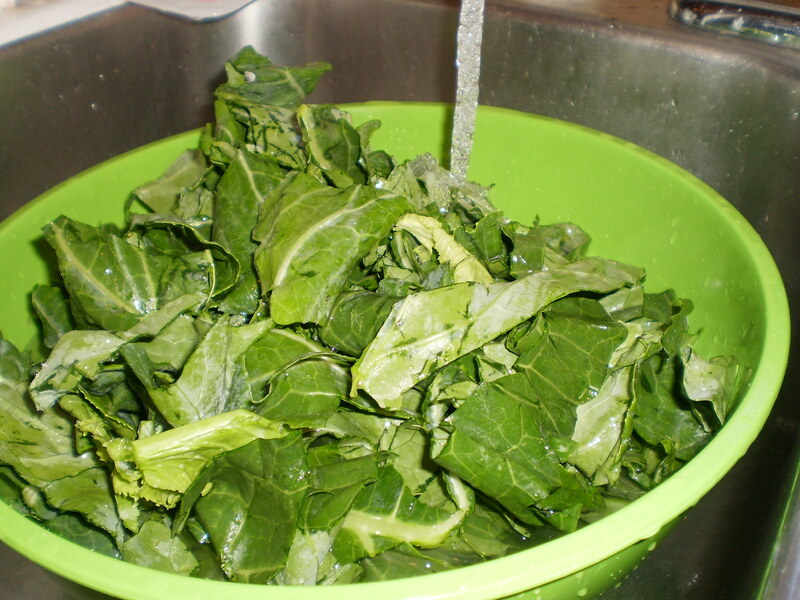 Cooking collards 101...who knows how to cook collards? Do you know what a collard even is? 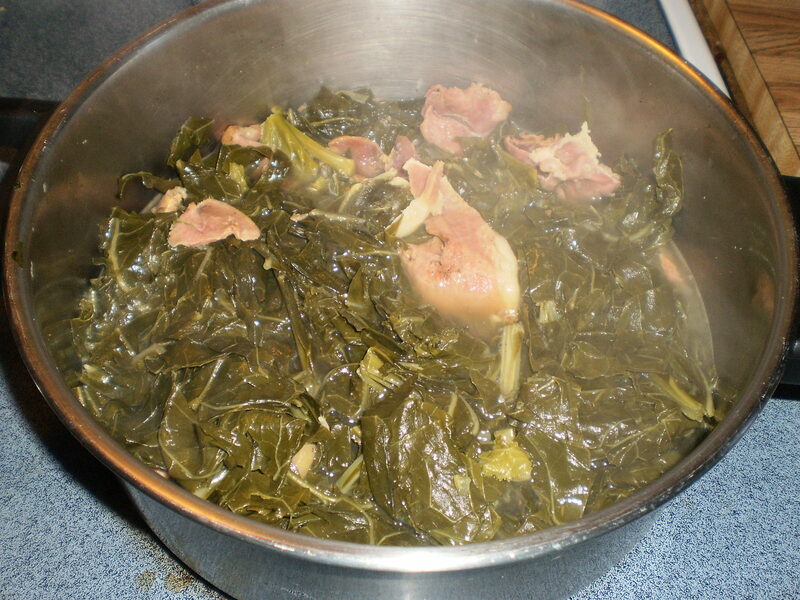 Chances are if you are from the South, any where south of Virginia, you are familiar with collards. Well, except maybe Florida as that is the Northern retirement community. Collards are very prominent in NC, SC, GA, LA, AL and MS.
Collards or collard greens are a dark green leafy vegetable that is in the kale family. They have a tough texture and should be cooked long and slow. However, there is that wonderful time of year, Thanksgiving, that we southerners look forward to. That is because the first frost has hit the leaves! This gives a sweetness and tenderness to the otherwise tough leaves. There is also a variety called cabbage-collard, very hard to find that is a light green, smaller bush and the leaves are more tender and sweet. Now let's talk about picking out good collards. You want healthy leaves, little to no holes, these are the markings of worms, no worms, best when purchased from a local farmer or friend who did not use any pesticides. The smaller leaves are more tender and have a less bitter taste. Buy the whole collard if possible or just tender leaves. 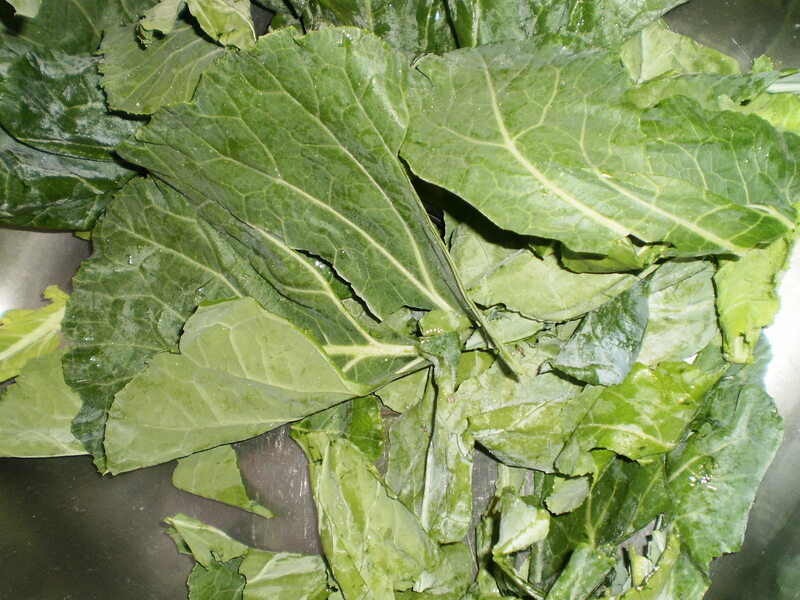 Wonderfully nutritious collard leaves are very low in calories (provide only 30 cal per 100 g) and contain no cholesterol. However, these green leaves contain very good amount of soluble and insoluble dietary fiber that helps control LDL cholesterol levels and also; offers protection against hemorrhoids, constipation as well as colon cancer diseases. Di-indolyl-methane has also found to be effective immune modulator, anti-bacterial and anti-viral properties by potentiating Interferon-gamma receptors and production. The leaves are also an excellent source of folates, provides about 166 mcg or 41.5% of RDA. Folates are important in DNA synthesis and when given during peri-conception period can prevent neural tube defects in the baby. 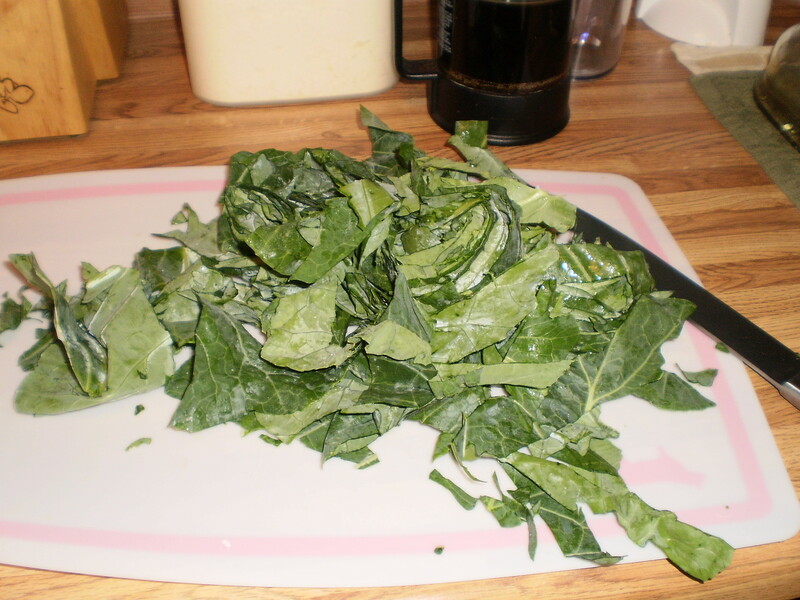 Fresh collard leaves are also rich in vitamin-C. Provides about 59% of RDA per 100 g. Vitamin-C is a powerful natural anti-oxidant that offers protection against free radical injury and flu-like viral infections. Collard greens are also an excellent source of vitamin-A (222% of RDA per 100 g) and flavonoid poly-phenolic anti-oxidants such as lutein, carotenes, zea-xanthin, crypto-xanthin etc. These compounds are scientifically found to have antioxidant properties. Vitamin A also required maintaining healthy mucus membranes and skin and is also essential for vision. Consumption of natural fruits rich in flavonoids helps to protect from lung and oral cavity cancers. This leafy vegetable contain amazingly high levels of vitamin-K, provides staggering 426% of recommended daily levels per 100 leaves. Vitamin K has potential role in the increase of bone mass by promoting osteotrophic activity in the bone. It also has beneficial effect in Alzheimer's disease patients by limiting neuronal damage in their brain. collards bought and the stems pulled out, they are tough and take longer to cook,they are also stringy and not favorable to eat. I cut my leaves up so they fit in the pot better and I can move them around during the cooking process with more ease. Wash them thoroughly with warm water, rub the leaves and drain them well. Repeat twice. 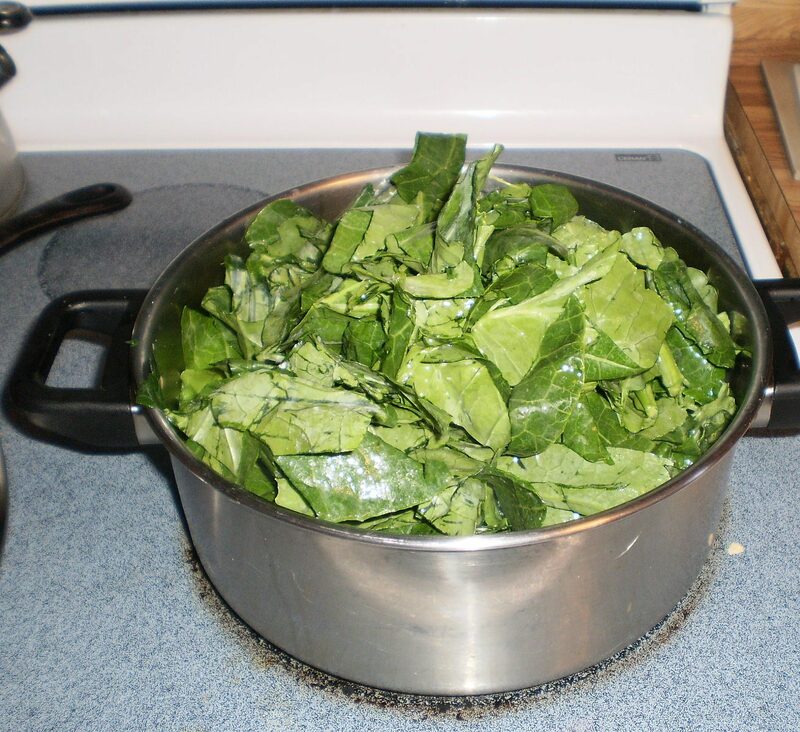 Place the washed, cut collards into a large pot, don't worry they will cook down much smaller than this. Put several cups of water, a spoonful of bacon fat (if you are REAL Southern) or oil, garlic and a piece of cure ham, ham hock, or bacon into the pot. Cover and cook on med. high for 30-60 minutes depending on the toughness of the leaves. Stir every 15- 20 minutes and check the tenderness. Add a dash of salt IF needed ,taste first. We add pepper vinegar to ours before eating. 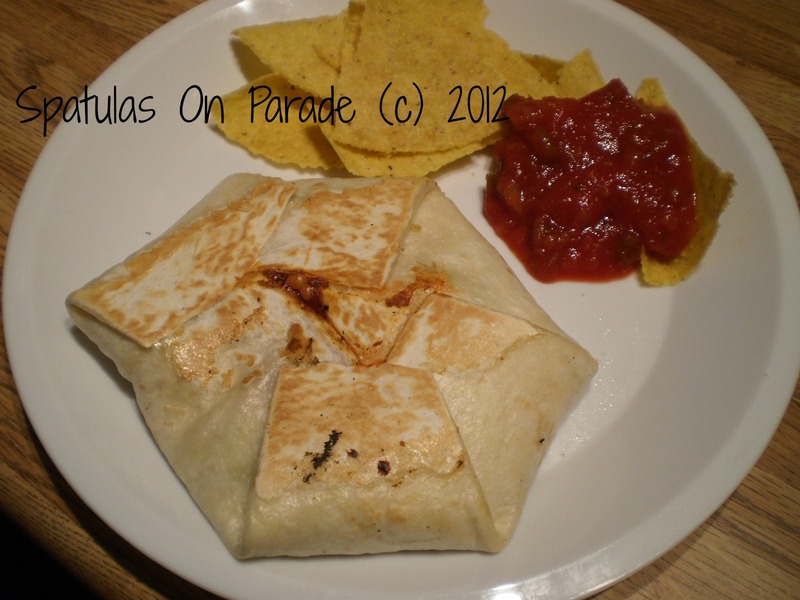 Hi folks, Friday and I hope you have checked out our Foodie Friends Friday link party today. It is full of FREAKY recipes as we prepare for Halloween, (or for those of us who don't celebrate), prepare for Fall and all the wonderful dishes that comfort and warm us through the cooler months ahead. Check the tab above marked Foodie Friends Friday to see this week recipe submissions. Come back on Sunday to vote for your favorite 3. 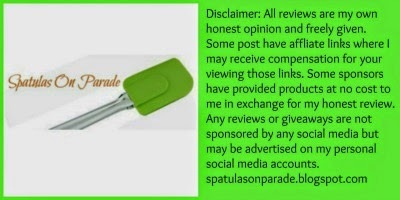 You can also enter to win several prizes, no need to be a blogger or submit a recipe. Readers are welcome to enter and encouraged to do so! 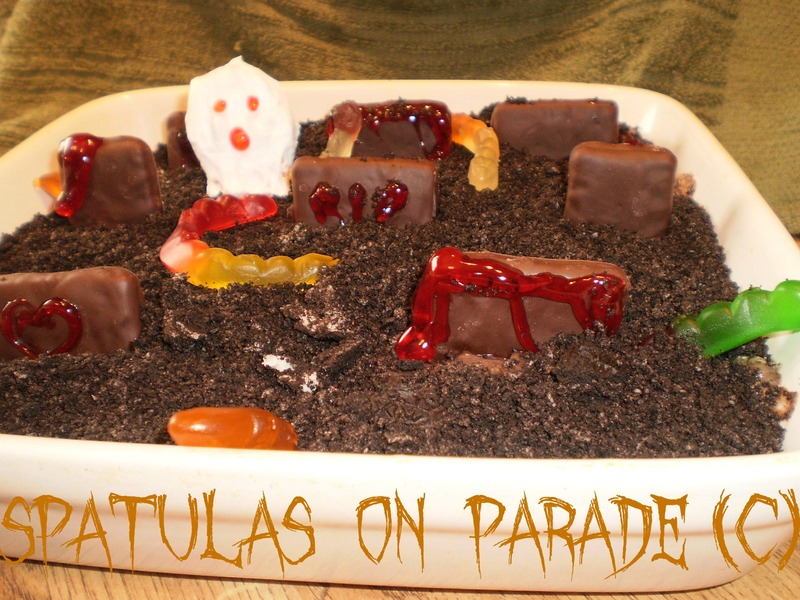 This week I made a crazy little fun dessert, Graveyard Dessert or dirt cup/cake as it is more commonly known. It taste great I promise! Last night we had the dessert but more importantly a lovely salad and our main course was...TexMex Chicken and Rice casserole. 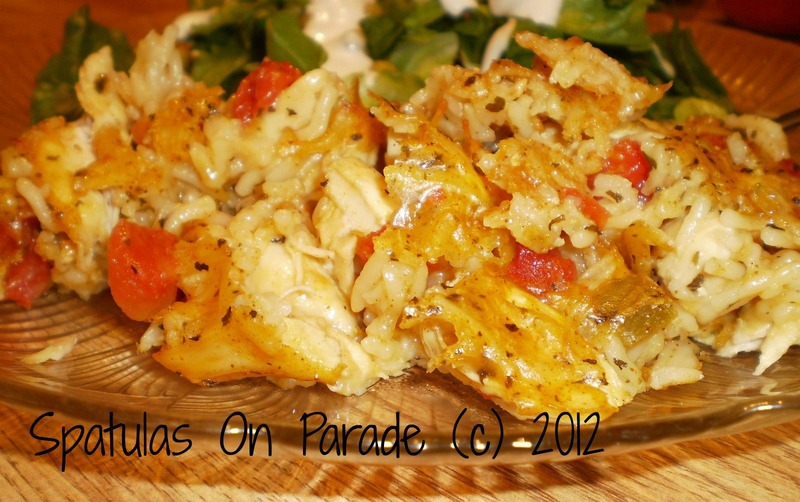 This is a very simple meal to throw together and oh so good! In a pan melt the butter, add the onion powder and pour in the rice mix. Brown and add the flavor package, broth and water. Allow this to cook for 10 minutes. Stir in the Rotel (diced tomatoes with green chiles), chili powder, basil, cumin and chicken. Stir well and lastly add the cheese. 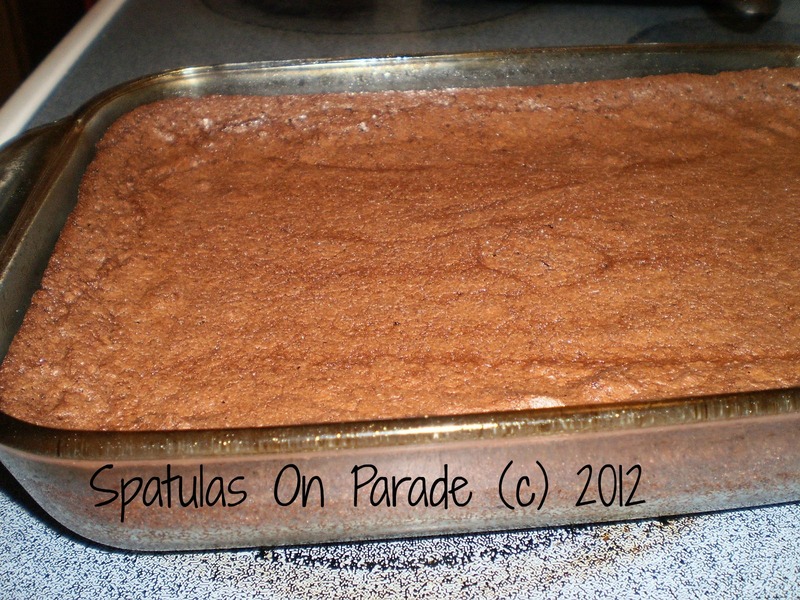 Pour the mixture into a 13 x 9 baking pan. I am not a Halloween person, we have never decorated or celebrated with our kids or during our marriage. So this recipe may seem a little odd. I have loosened up over the years. I am still not a "Halloween" person per say but know that it is not going to kill me to have a little fun. Our Foodie Friends Friday, is doing a "freaky Friday" and I needed a recipe. So, I adapted an old favorite. I am sure you are familiar with "dirt cups" or "flower pot cakes" it goes by all sorts of names. I just decorated it this time for our FFF "FREAKY" link party! I put my Oreo cookies into the food processor and turn them into a nice powder/dirt consistency. Mix the milk with 2 pkg of pudding, allow it to sit for about 5 minutes and add the whipped topping. Stir in 2/3 of the cookies. 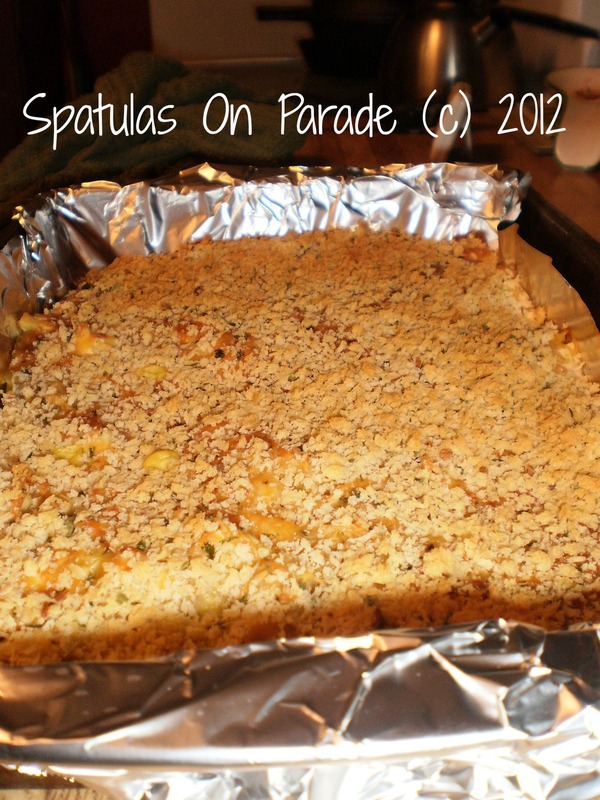 Sprinkle a few crumbs in the bottom, pour the mixture on top. Write RIP on the chocolate grahams. Drizzle 'blood' on a few chocolate grahams. Dip nutter butters in whipped topping, for ghost. Stick worms into the ground. My husband loves English Muffins. One night he said, I'm in the mood for an English Muffin. So this put me on a search for the perfect recipe. I found one and gave it a shot. It is really easy and they taste great. I tell you, once you eat a FRESH English Muffin, you really won't want to buy one of those round cardboard disk in the plastic bags. 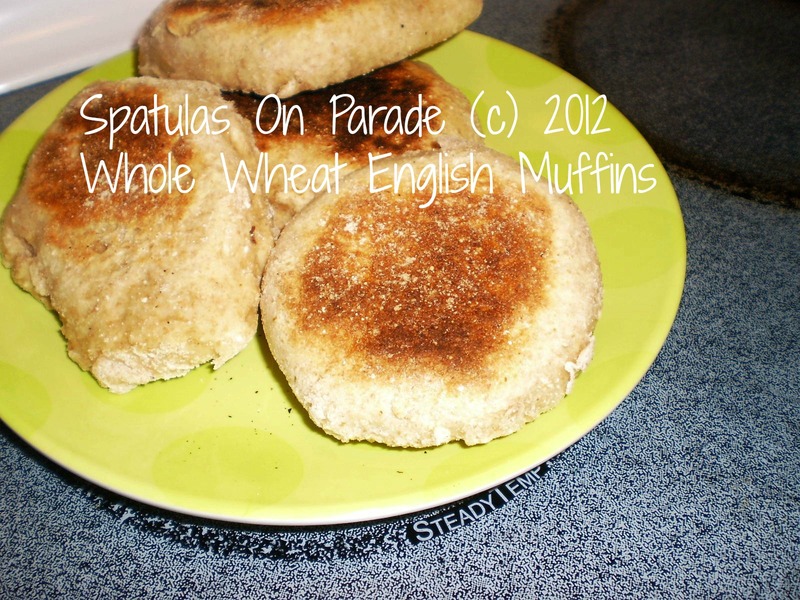 *To make regular English muffins; omit whole-wheat-flour and use 3 1/3 cups all-purpose flour, omit baking soda and omit buttermilk and use 1 cup of regular milk instead. 1. In a mixing bowl, stir together the flours and dry yeast. Mix well and pour dry flour mixture into bread machine. Make a depression in center of flour to pour liquid into. 2. In a small mixing bowl, stir together the warm buttermilk, beaten egg, sugar, salt, baking soda and melted butter. Mix well. Pour liquid into center of the depression you made in the flour in the bread machine. 3. Set bread machine to MANUAL DOUGH CYCLE. Monitor dough as it mixes for the first few minutes and add more flour or water as needed, a tablespoon at a time, to form a smooth ball of dough. It should be firm enough to hold its own shape and not sticky. It should not be so dry that it is crumbly. 4. When the bread machine completes its mixing and kneading cycle, turn it off and remove the dough. Don't allow it to rise in the bread machine. 5. Dust a bread board with about 1/2-tablespoon of corn meal. If you need to, you can dust the dough with a little dry flour, if it's too sticky to handle. 6. Place dough on bread board and divide dough into 12 equal sized pieces. 7. Take each piece of dough and roll into a ball, then flatten it into a disc about 3-inches across and 1/4-inch high. 8. Dust a cookie sheet with 1/2-tablespoon of cornmeal and lay each flattened piece of dough on cookie sheet, about 1-inch apart. 9. Place in a warm place to rise, (like oven that is off, with the oven light turned on) and allow dough to rise for 1/2-hour. 10. Heat a griddle or skillet to medium heat, as if you were making pancakes. If using an electric skillet or griddle set it to 275-F to 300-F. Don't add oil to the griddle. A non-stick surface or cast iron works well. 11. The dough will look slightly puffy, like large cookies, that's okay, they will puff up a lot more during cooking. 12. Carefully pick up each piece of risen dough and place it on the hot griddle. Trying to move them with a spatula will deflate them. 13. Reduce heat slightly on griddle and cook the dough for 5 to 7 minutes on each side. 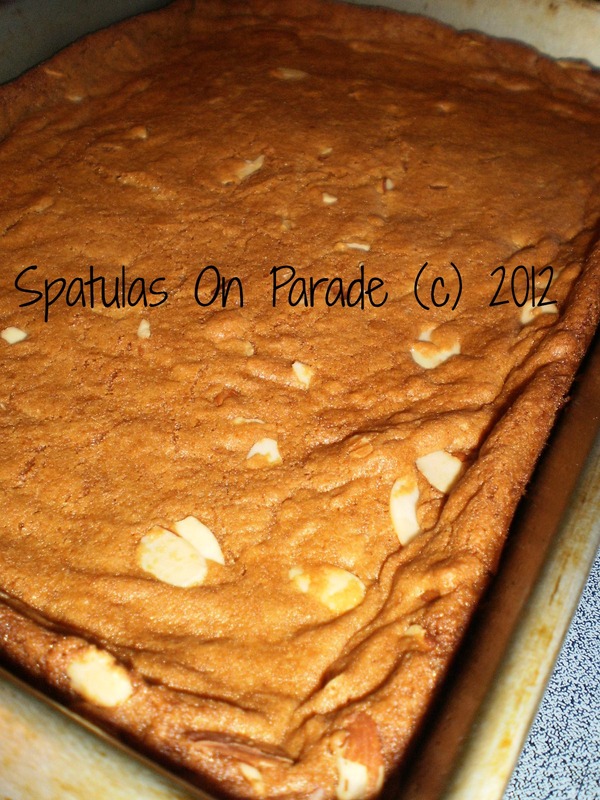 They can be turned with a spatula once they are cooked on one side. 14. They are done when they are golden brown on the top and bottom. Split them using a fork. Toast them and serve with butter and/or jelly. When cool, they can be stored in a plastic bag. 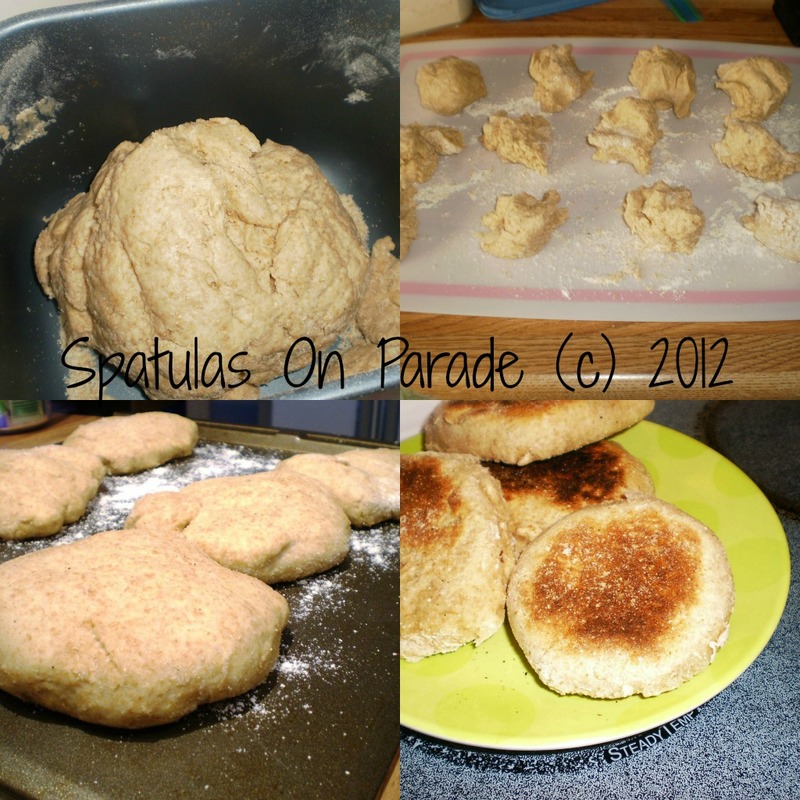 Makes 12 Buttermilk Whole-wheat English muffins. HEY have you been and checked out our magazine yet? We are covering everything from a to z...apples to zucchini...acidic bodies to zest and everything in between. I have the privilege of being grouped with a lovely bunch of ladies, my fellow bloggers, in this venture. Also, on Fridays we will continue our Foodie Friends Friday link party! There is a tab at the top of my page for you to follow each week. Be sure to link your recipe to our site www.foodiefriendsfriday.com .This is a great avenue to direct traffic and new followers to your blog or Facebook page. You will also see wonderful recipes and meet lovely people. Grab a cup of coffee, tea or whatever you prefer, sit down, prop up your feet and read a spell. Don't blame me if you find a ton of tempting recipes to find, just say THANK YOU and hit the store to grab the ingredients. Then be sure to stop by and tell us all about it! I can not believe how our magazine has taken off! It is so exciting and I hope that each of you has stopped by to check it out and will continue to follow the adventure. So, let's see, last night we had Italian Chicken. It was quick,easy, and I had all the ingredients on hand that I wanted to use. So it was a win win. All the ingredients go into the crock pot and when you are ready to eat, cook your pasta ... wa la... done! The first set of ingredients went into the crock pot, on low, for 4 hours. 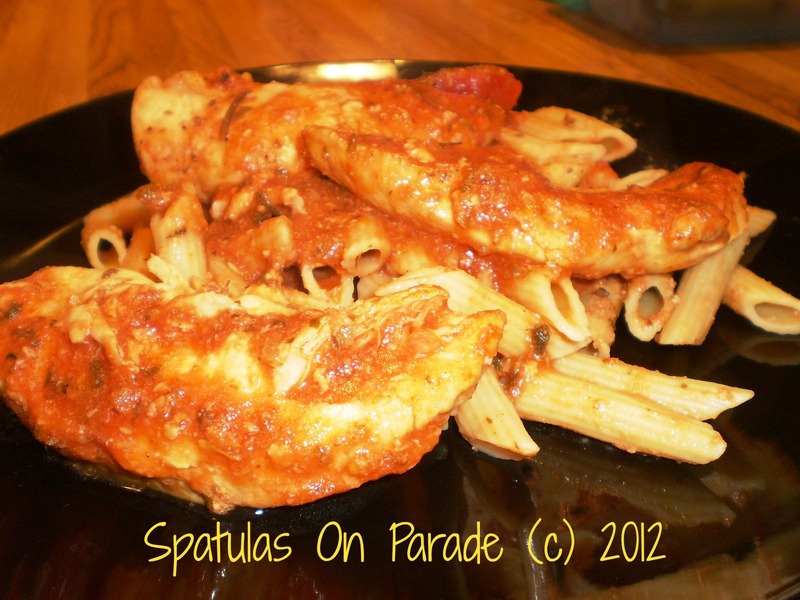 When we were ready to eat, I boiled 2 cups dry penne pasta. Once the pasta was done I drained it and sprinkled Parmesan cheese over it and stirred it in. The pasta was put on the plate, sauce, Italian cheese and chicken. When you read the title, did you go, "WHAT" oh yeah! 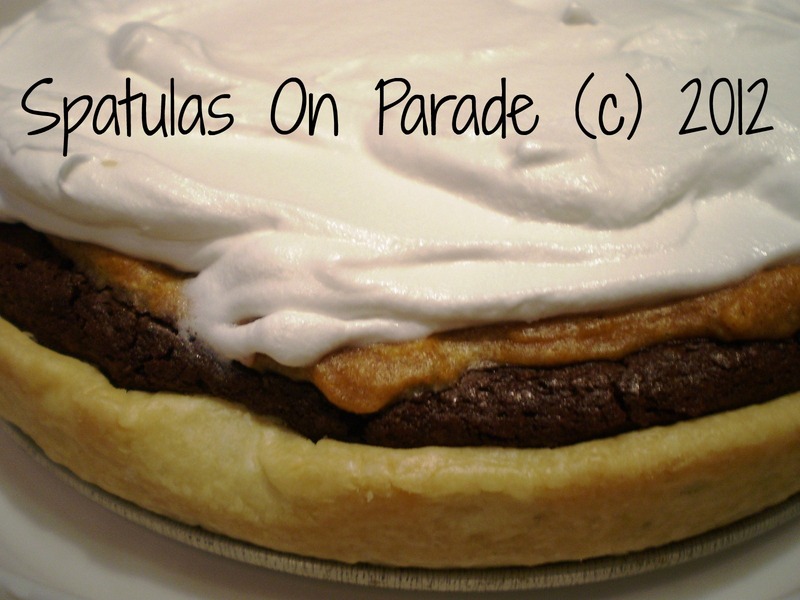 Scrumptious overload is what this pie should be called! I saw this on our FFF link party this weekend and had to jump right on it! Thanks to Jocelyn over at Inside Bru Crew Life she called it Pumpkin Cheesecake brownie pie. I made a few changes, as usual when I do any recipe. This was just so decadent! Rich ,moist, wow...you really should give it a go! I used my spring form pan for this pie. Sprayed well and place the pie crust on the bottom and up the sides. Spread the brownie batter carefully on the bottom. Bake at 350 degrees for 30 minutes. While this is baking, prepare the cheesecake batter. Mix the cream cheese, sugar and maple syrup. Next add the egg and pumpkin. Last add the spices and flour. 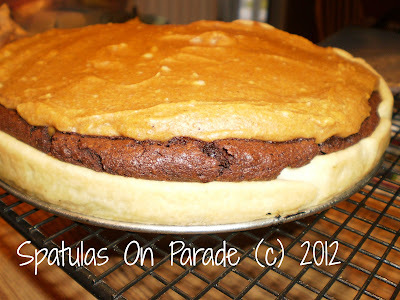 When the brownie part is done, remove and CAREFULLY spread the cheesecake mix over the brownie. Place the spring form pan on a sheet of foil and wrap. Place inside another pan and fill half way up the sides with water to form a water bath. Your cheesecake will bake and not crack on the top. Now bake another 30 minutes. Remove when done and allow to sit in the pan for 15 minutes. Remove the side of the spring form and let it sit another 30 minutes. Cover the top with cool whip and let set another hour IF you an wait! Recently I was given the privilege of reviewing Don Tomas coffee. If you are not familiar with this coffee company, please take a moment and visit their website or Facebook page. I, like several of my Foodie Friends Friday group, was sent a bag of their Heritage blend coffee. I am not able to drink coffee due to health issues, however, my husband and sons are coffee connoisseurs. So they were very eager to try a new coffee. We fix our coffee in a french press because my husband likes his coffee to walk down his throat vs. the normal drinking :-) ha seriously he loves a strong cup-o-joe. This coffee won big reviews from all 3 guys and my future daughter-in-law. Smooth, rich, nice, no after taste, not bitter, were just a few of the comments. I like to put coffee in brownies, I think it adds a richness to them. Which means, you know I had to bake a batch right away. Delicious and when added to my fresh milled flour they were doubly good. 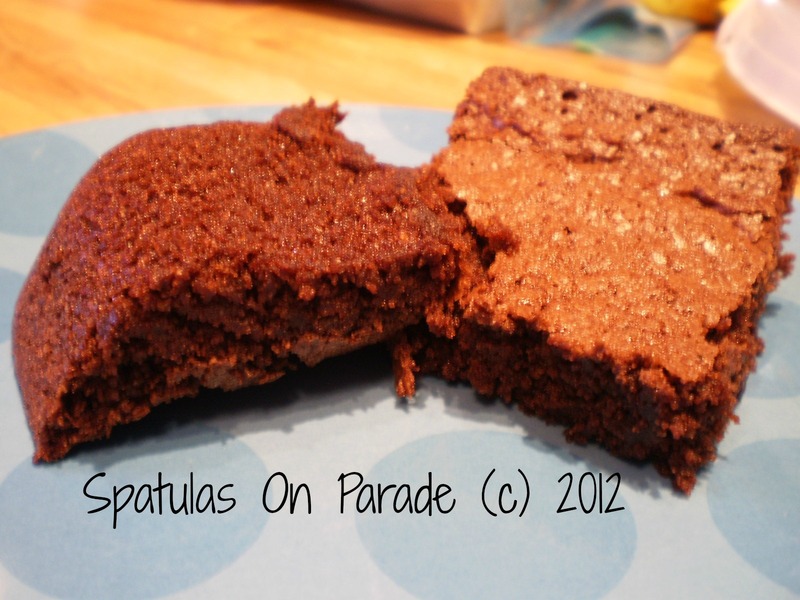 Be sure to check out Don Tomas and give these brownies a try when you do. Melt the butter, stir in the sugar and vanilla. Mix well. Add the eggs one at a time and stir well. Add the remaining ingredients. 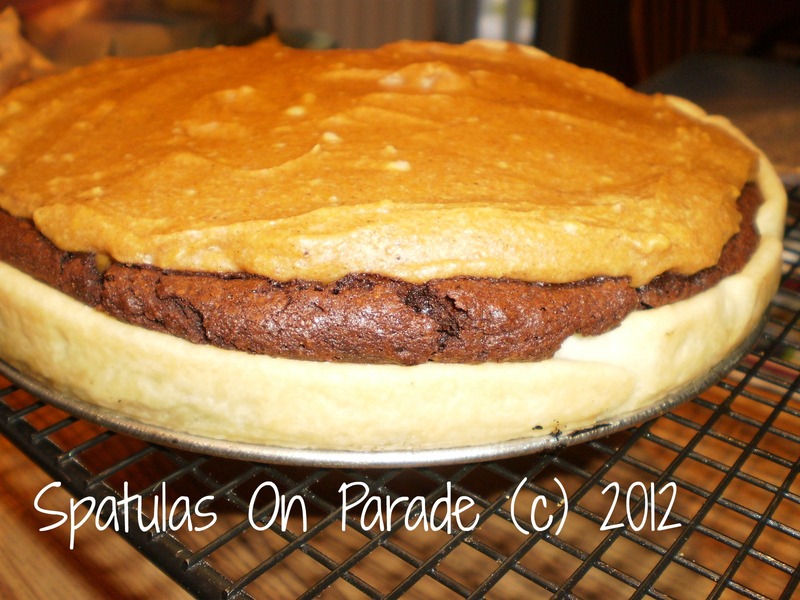 Pour into a greased 8x8 or brownie pan and bake.